Measures to champion the rights of homebuyers and help ensure that when they buy a new home they get the quality of build they rightly expect. The New Homes Ombudsman will protect the interests of homebuyers and hold developers to account when things go wrong. The government is committed to delivering 300,000 homes a year by the mid 2020s and has today (1 October 2018) announced further plans to speed up the planning system as well as make better use of land and vacant buildings to provide the homes that communities need. This includes more flexibility to extend upwards on existing blocks of flats, shops and offices making better use of space by increasing housing density. Championing ambitious councils keen to make new garden communities a central part of their plans for housing and economic growth and have local support there will be clearer rules to give more certainty for communities when land is needed to make this a reality. To support a successful Commonwealth Games in 2022 and create a legacy long after the games are over, £165 million has been announced to unlock up to 5,100 homes in Birmingham and provide the infrastructure to support these new homes. As part of its comprehensive programme to improve building safety following the Grenfell Tower tragedy, the government has also confirmed that it will ban the use of combustible materials on external walls of high-rise residential buildings. The ban will also apply to hospitals, care homes and student accommodation over 18 metres. The government has announced that there will be a New Homes Ombudsman - a watchdog that will champion homebuyers, protect their interests and hold developers to account. We intend to legislate to require all new developers to belong to a new homes ombudsman. House buyers should be confident that when they purchase a new home, they get the quality of build and finish they expected. We will work with consumers and industry to develop our proposals and publish more details in due course. In the meantime government expects industry to continue to improve the current redress arrangements and improve the consistency of quality for new build homes. The government set out a package of reforms to deliver 300,000 homes a year by the mid 2020s through planning reform and targeted investment. As part of this the government has announced plans to consult on further measures to speed up the planning system as well as make better use of land and vacant buildings to deliver the homes that communities need. • introducing a new permitted development right to allow property owners to extend certain buildings upwards, while maintaining the character of residential and conservation areas and safeguarding people’s privacy. • clearer guidance to give more certainty for communities when land is needed to make a New Town a reality. • giving local authorities more flexibility to dispose of surplus land that could instead accommodate new homes. The government will consult on these new measures in due course. Funding to help deliver the 2022 Commonwealth Games Village, provide necessary transport improvements and create a legacy after the games has ended has also been announced. Birmingham 2022 is set to showcase Birmingham, the West Midlands and the entire country to the rest of the world as a destination for international trade, education, world class sport and tourism. Following the Grenfell Tower tragedy the government established a comprehensive building safety programme that included an independent review on fire safety and building regulations. In the summer the government published its response to this review and said it would ban the use of combustible materials on external walls of high-rise buildings subject to consultation. Following this consultation the government has today (1 October 2018) confirmed that it will take forward this ban on all high-rise buildings that contains flats, as well as hospitals, residential care premises and student accommodation above 18 metres. 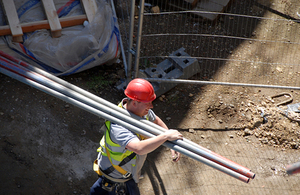 This ban will be delivered through changes to building regulations guidance and will limit materials available to products achieving a European classification of Class A1 or A2.